MetalGuard Ultra is a high specification thin film coating which leaves a 2 micron clear film which will not yellow with age. It contains both ferrous metal and yellow metal corrosion inhibitors. Supplied as a liquid in 250ml cans it can be applied by brush, spray or dipping. Unlike the majority of other thin film coatings available on the market, it complies with defence standard 68-10/2 (PX24) and NATO CODE C-634 which is indicative of the quality of the product. Under typical workshop conditions it can be expected to provide protection for up to two years. It is NOT designed to protect metals exposed to ‘the elements’. 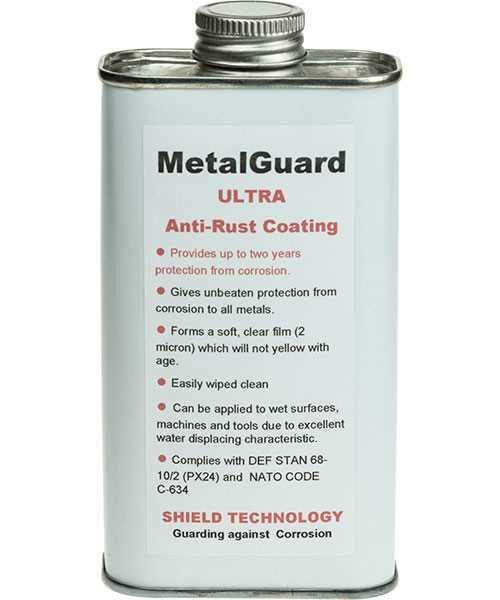 MetalGuard Ultra does not contain silicone. PLEASE NOTE: Due to the flammability of the product it can only be sold in the UK mainland.